You can positively feel the chill of the marshes seeping into your bones in Neil Bartlett’s adaptation of this dark classic, full of foreboding and played out on a stage never fully lit. Upturned steel chairs double as gravestones. The space remains empty for the most part, an enclosure into which action erupts to startle the audience as Dickens startled his readers. It works beautifully as an ensemble piece. A small band of watchers, sometimes a comic and sometimes a malevolent presence, leans in to eavesdrop on conversations and to hand props to the players in silent commentary. Only two characters – Joe Gargery (Jack Quarton, who doubles as the chilling Mr Jaggers) and Herbert Pocket (Bryn Holding, doubling as Magwitch’s nemesis, Compeyson) – exhibit real human warmth. Images burn themselves on the mind. Ella Vale’s sour and venomous Mrs Joe slaps butter on doorstep bread. Polly Lister has a powerful stage presence as Miss Havisham, upright in her invalid chair or teetering on two sticks but with a voice still strong and mocking. The sliding in of a great candlelit banquet table is one breath-holding moment and her crumpling death by fire is a theatrical tour de force. She looks reduced to a heap of ashes. Geoffrey Breton plays Pip convincingly throughout, from terrified boy to gentrified man, and Kate Spencer is a chillingly detached Estella. 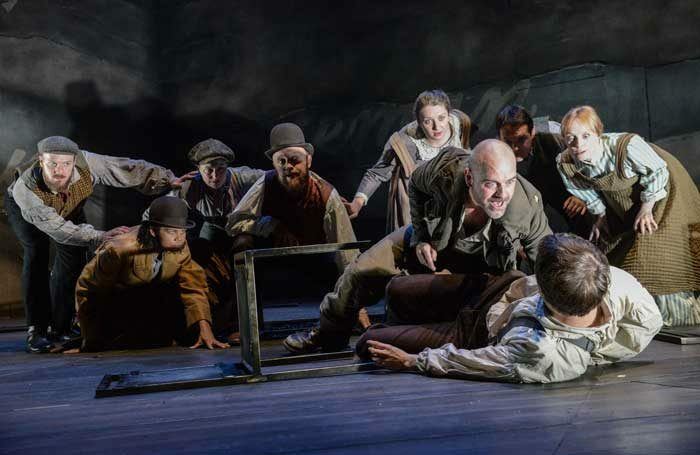 The biggest shock theatrical moment comes with the drama on the River Thames and they’ll be talking about this in Derby for a very long time.